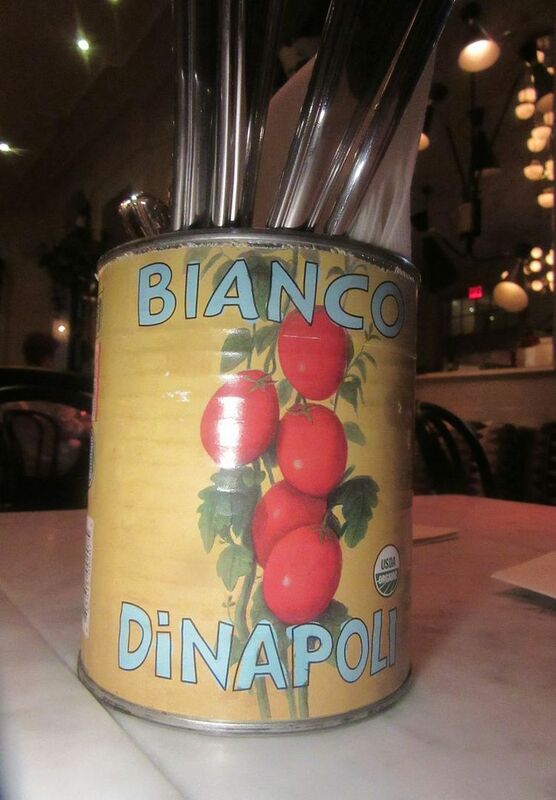 A clue that it’s casual and improvisational: Flatware and paper napkins in a tomato can on the table. I haven’t eaten anywhere cheap in a long time. Well, granted I can get a great escarole salad at L’Amico for $14 and a soppressata pizza for $16, but pastas start at $24. 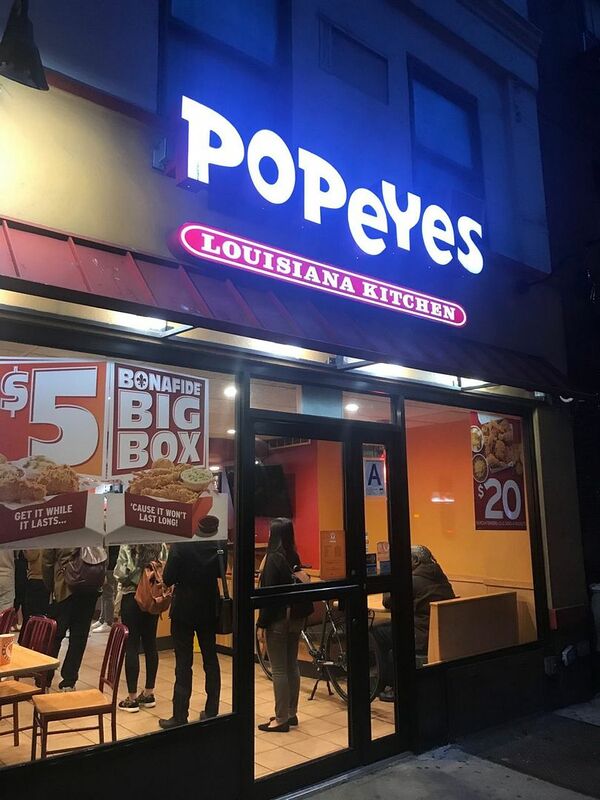 Oh yes, I did recently wallow in a great fix of fried chicken for $5 at Popeyes. Earlybirds get fussed over before the crowds start pressing in. But dinner with waiter service and cocktails…I haven’t seen as shy and obliging a menu as that of Old Rose in decades. And I’ve been around since the days when the ladies who lunched used to complain about the $3.50 extra charge for coffee on the $8.25 prix fixe at La Grenouille. It’s cut-rate. It’s pleasant. It’s not that noisy. Ok for a quick snack. And you can study young girls without getting arrested. 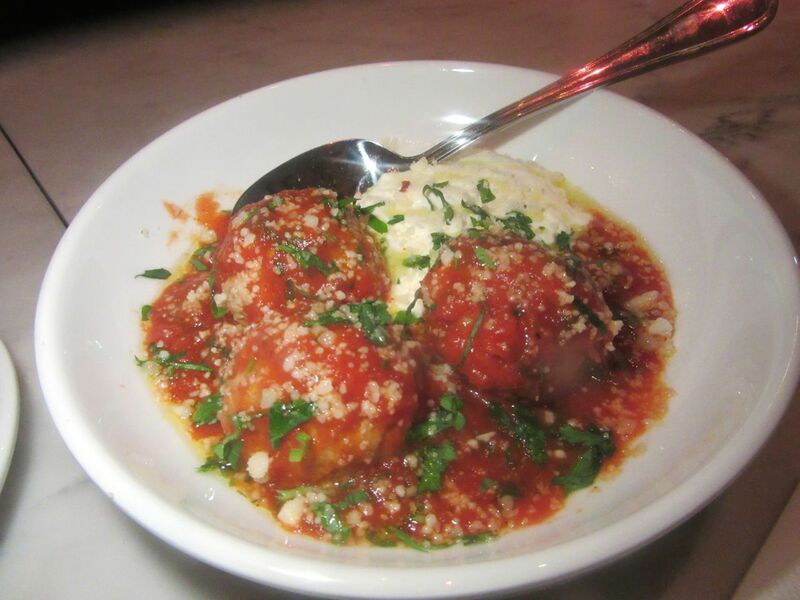 Excellent in-house baked bread gets grilled and buttered and served with lush tomatoes sprawled on burrata. 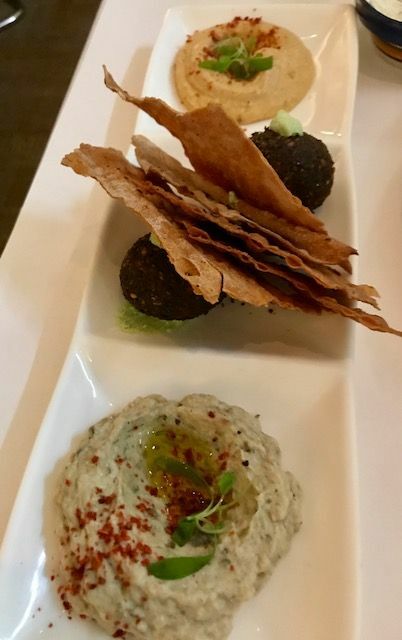 Too bad not everything is as thrilling as chef Joey Scalabrino’s sensational crusty sourdough, or even as good as the $12 crispy rice salad -- a crunchy toss of avocado, tomato, pistachios and pickled jalapeño. We’re ordering from what’s listed as a preview menu, and frankly, most of what we taste is not good enough to send you to this storied corner of Jane Street, where the survivors of the Titanic stayed during the inquiry into its sinking. 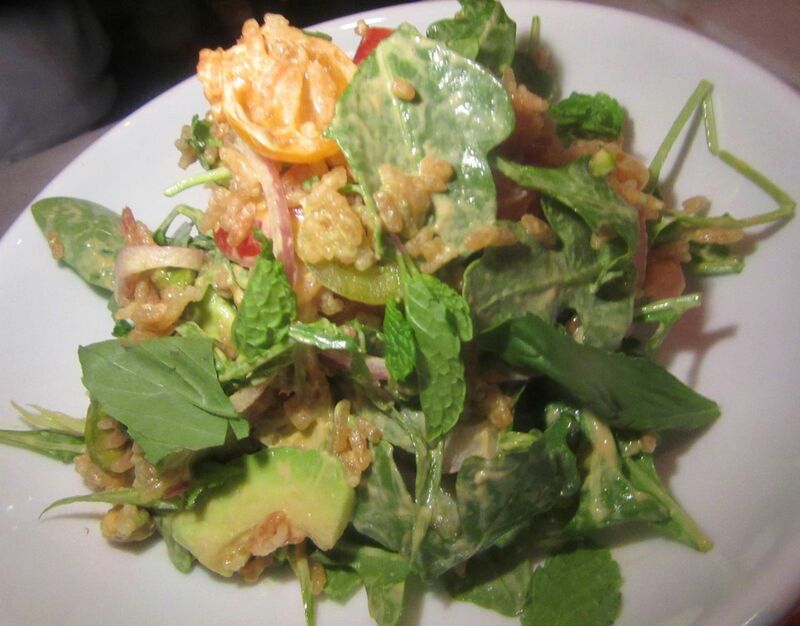 Crispy rice salad is a fine toss of avocado, tomato, pistachios and pickled jalapeño the table can share. Even so, by nine on Thursday evening, the place is rocking. 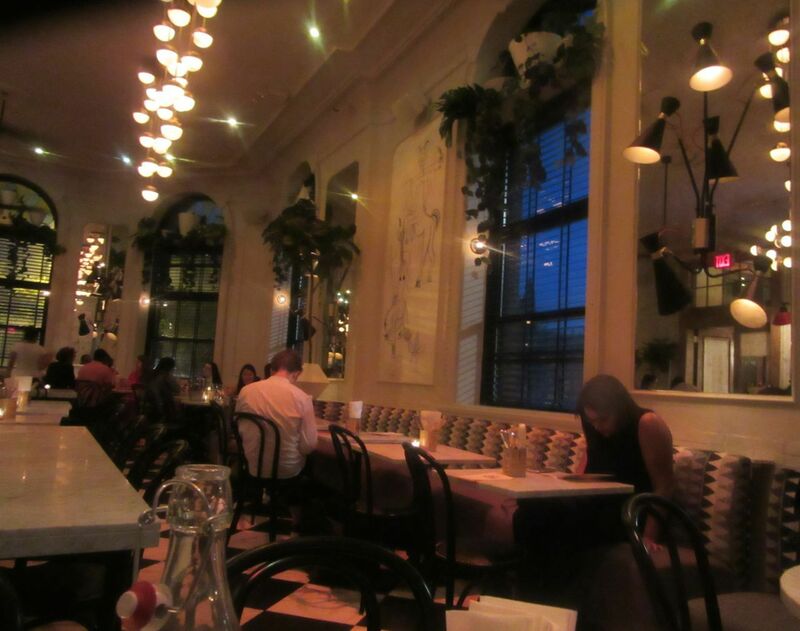 Formerly Café Gitane, the just-launched, all-day Old Rose, in the Jane Street Hotel, already seems to be a haven for young women. For some reason, the modest prices perhaps, the place draws an eclectic mix of youngish female duos. They hang their bags on the hooks under the bar, hug a waiting pal once, maybe twice, then sit wrapped in conversation, sipping until they decide to move to a table for dinner. I sense an homage to Picasso in a trio of paintings by Stefano Castronovo. The landmarked hotel itself, on the far western edge of the Village, was exquisitely restored in 2008 on its centennial. It began as the American Seaman’s Friend Society Sailors’ Home and Institute with ship’s cabin-like rooms. 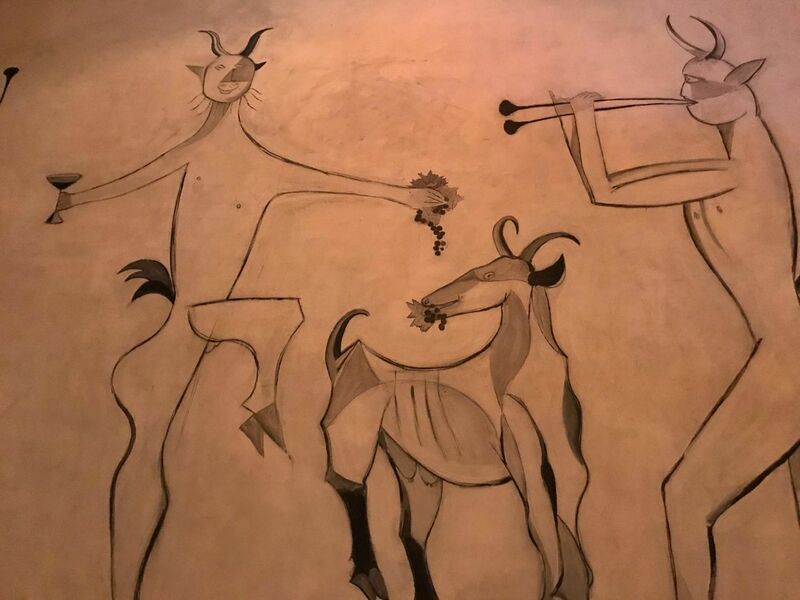 This dining hall, to the right as you enter, has tall, rounded windows looking out at the highway, with plants coiling down from shelves above, and a trio of paintings of Pan by Stefano Castronovo that evoke thoughts of Picasso. There is Calabrian chile aioli for dipping and a lemon to squeeze over the fried squid. The floors are black and white squares of marble, and tables are bare except for flatware and paper napkins piled into an empty tomato sauce can. I’m early and a server offers to bring me complimentary fizzy water. I study the menu, it’s small, not many options. There are Negronis and Black Manhattans on tap and cocktails, $13 to $15. I decide to wait for my pals to arrive. 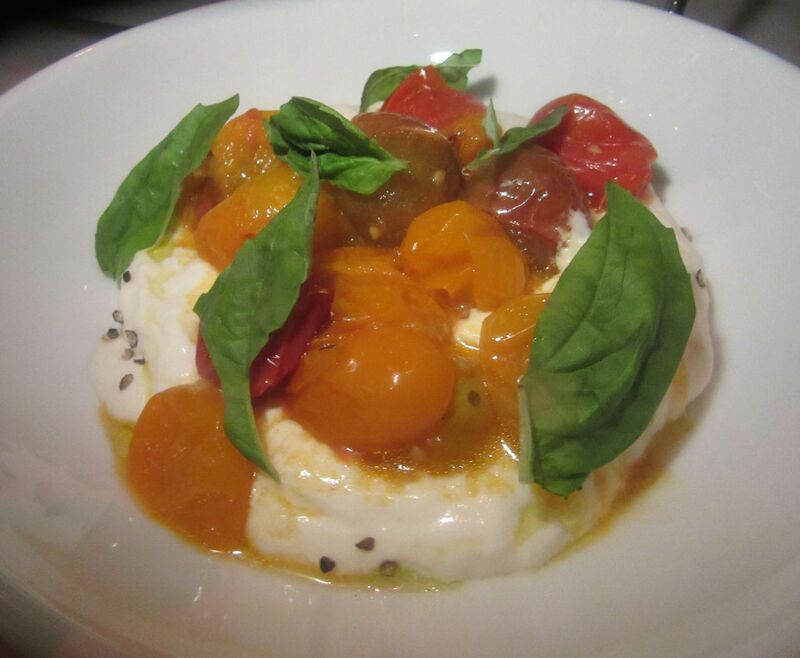 Here’s a closeup of burrata with small ripe tomatoes, a must for the grilled homemade bread that comes with. 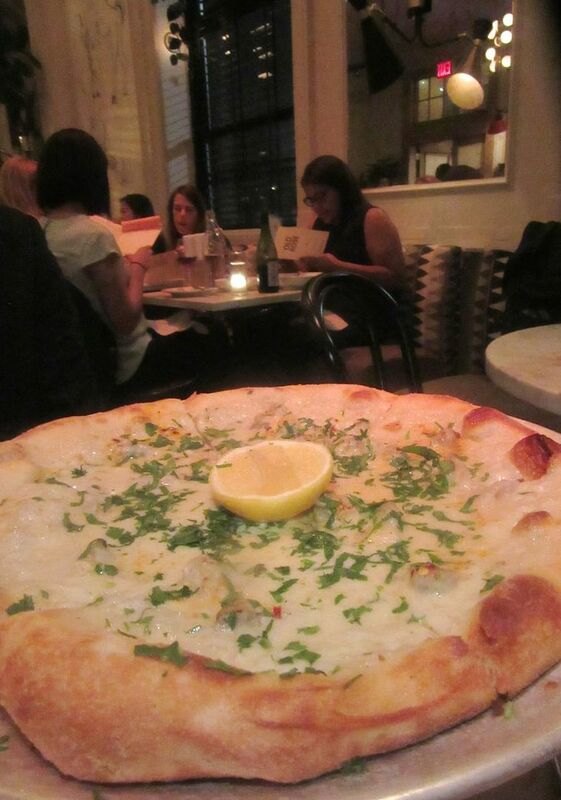 We rarely pass up a chance for pizza in my crowd, so tonight we share this very ordinary clam pie. For me the evening is like an excursion into a time warp, starters and salads starting at $9, topping out at $13, pastas in the teens. 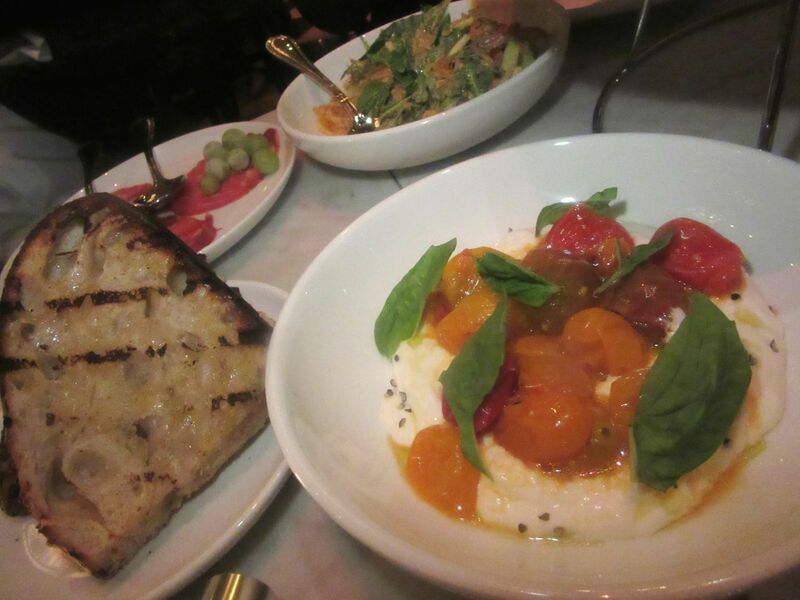 Also $13, marinated tomatoes on burrata (made in house by hand) with grilled slices of the excellent sourdough. That makes the very ordinary clam pizza seem a bit pricey at $20, especially when the vodka-tomato-sauced pie with burrata is just $16. Frozen grapes inhabit a landscape of spicy coppa slices. A clever concept, new for me. 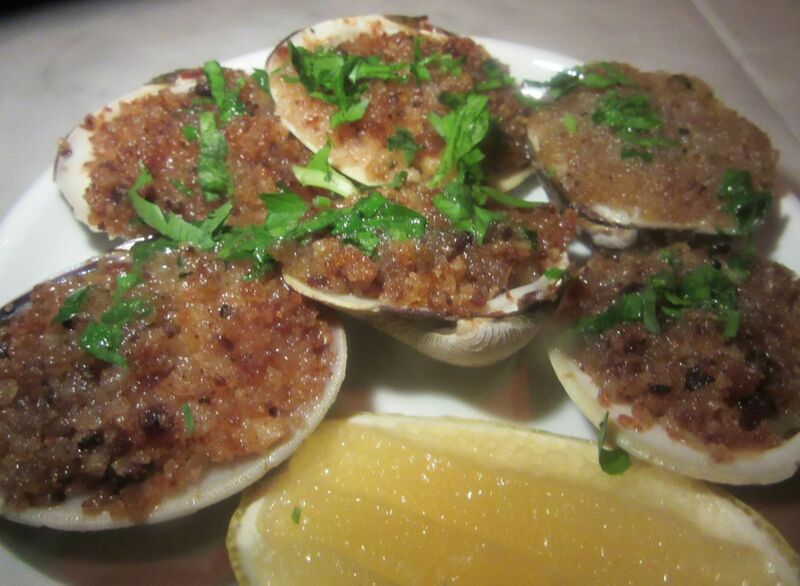 The spicy clams are strangely listless. 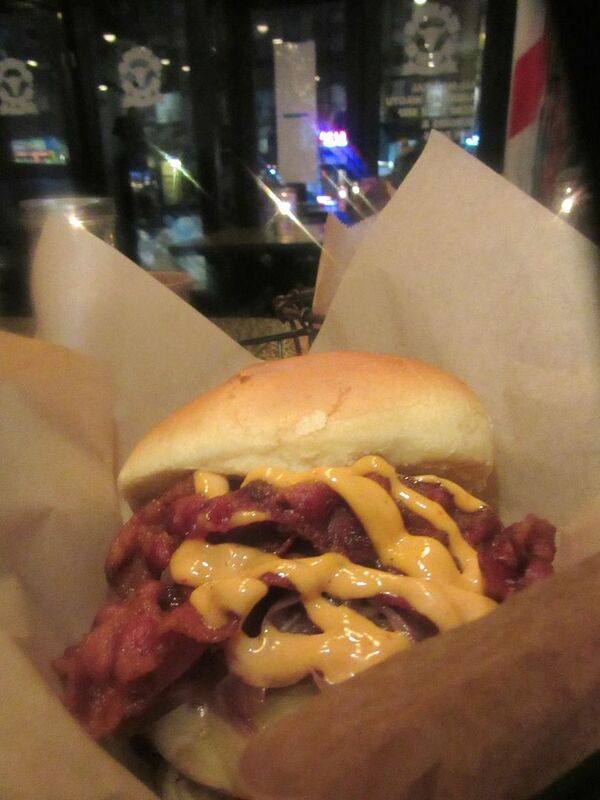 “All the dishes on our menu are meant to be shared so don’t hold back,” the menu advises. We share. That’s what we always do. But first we have to persuade the waitress to bring serving spoons and forks. The spicy coppa comes populated with frozen green grapes. I’m impressed by the mind that dreamed up that combo. 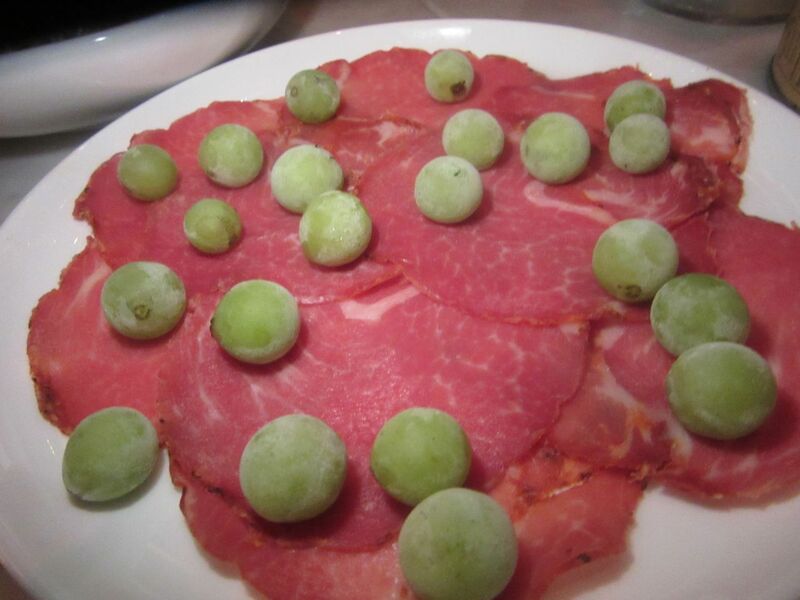 Unwilling to wait, I take two slices of the cured meat with my fork and pop a couple of frozen grapes into my mouth. 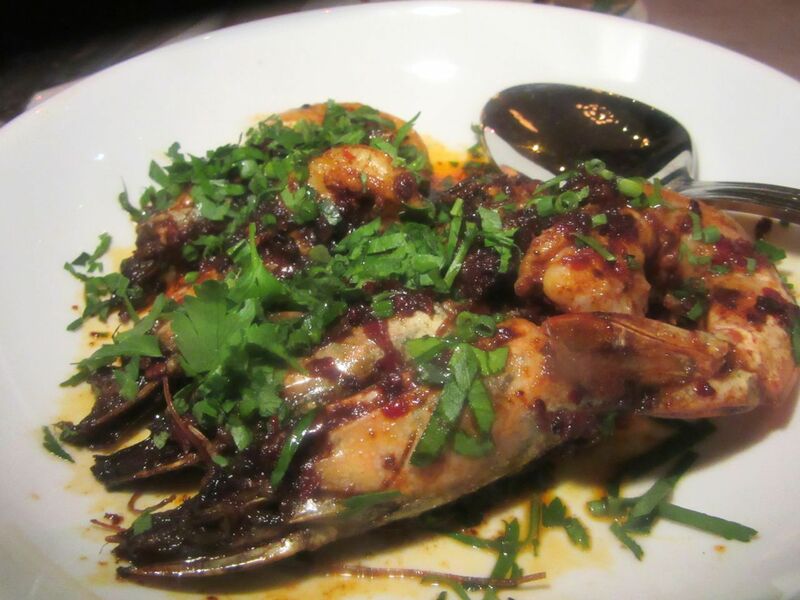 Grilled shrimp with spicy Calabrian ‘nduja and chive are small and tight but just $12. 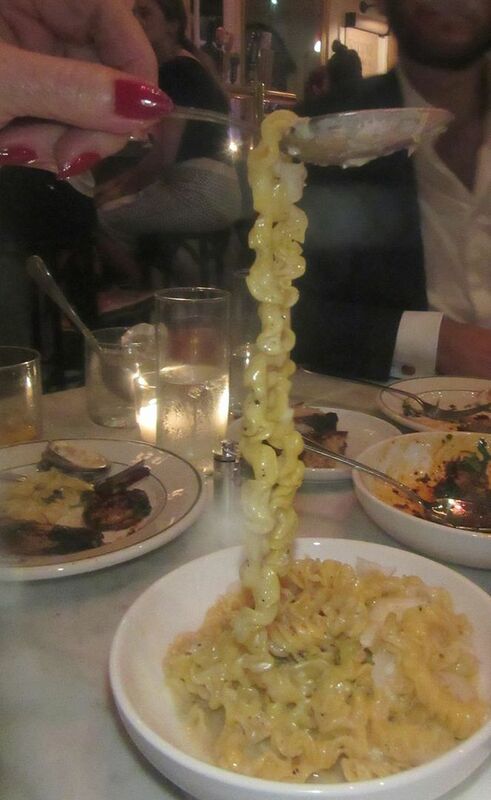 Long trails of fusilli – one of three pasta specials -- deserve a more intense toss of cacio and pepe. A quartet of fish and meat items, nothing more than $14, suggests that the chef is warming up slowly, seeing what traffic will allow, or maybe what his kitchen can do. We decide to try them all. Grilled shrimp with spicy Calabrian ‘nduja and chive ($12) are better than the slightly anemic baked clams. 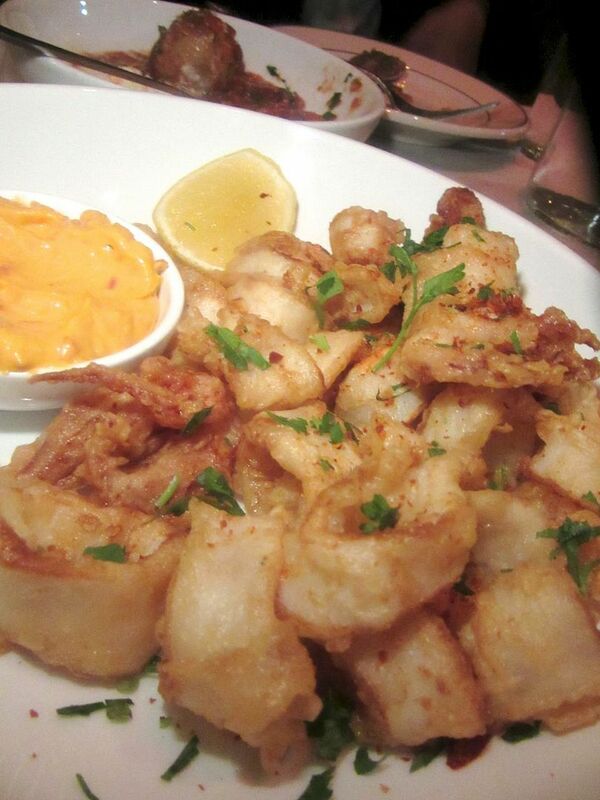 There is Calabrian chile aioli for dipping and a lemon to squeeze over the fried squid. I’m eating more than my share. I’m sad to report that the meatballs are the most boring I’ve ever tasted, and the long strands of fusilli cacio e pepe (just $14) could also use a little more seasoning oomph. I notice that we sit surrounded by seemingly happy campers, but then, you never know. Do they love life or each other or do they love the bucatini Bolognese? 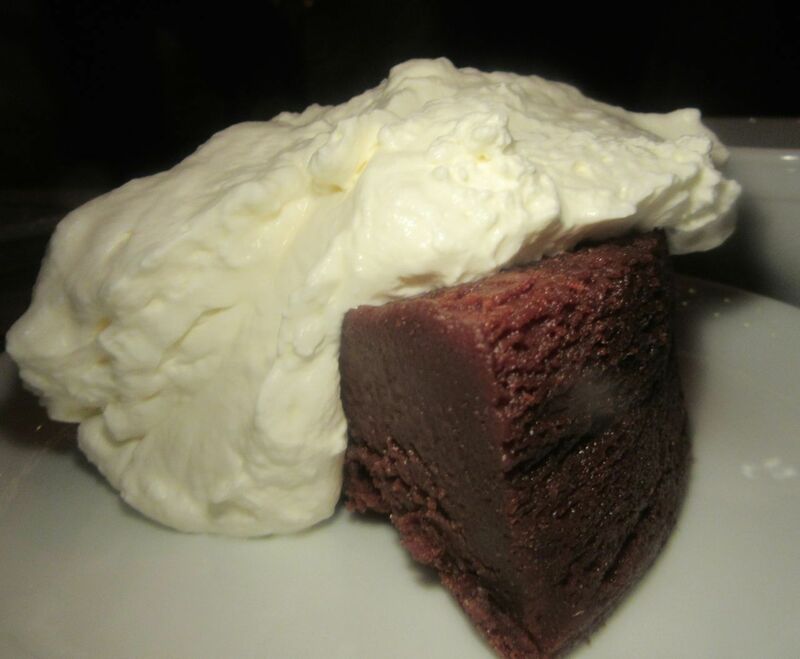 A fudgy chocolate cake under a drift of whipped cream is not to be sneered at. The chef personally delivers complimentary desserts: two portions of chocolate cake with a drift of whipped cream and a bowl of panna cotta topped with a rubble of caramel apple balsamic glaze, dusted with amaranth. 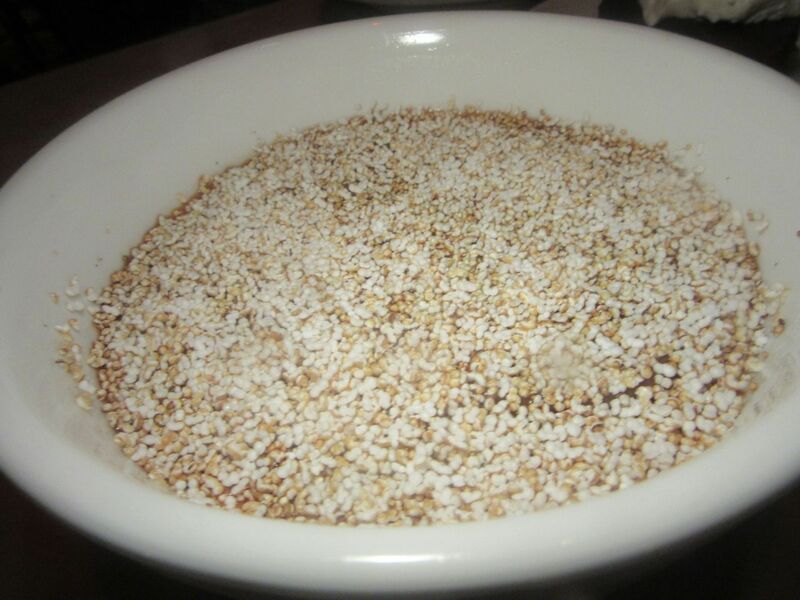 A rubble of caramel apple balsamic glaze with amaranth tops a big bowl of panna cotta. Our only hope for a cab on this almost deserted street is a really late diner or a Jane Street Hotel guest. One friend calls an Uber and just as the other gets set to tap the code into his phone, a taxi pulls up. As we wade into the pokey traffic, it occurs to me that I should have bought some of that fabulous bread. How great it would be for breakfast. 113 Jane Street in the Jane Street Hotel between Washington and West streets. 212 255 4143. Sunday through Wednesday 7 am to midnight. Thursday, Friday, and Saturday 7 am till 2 am.